We have found that pre-fab fireplaces are extremely easy to use and keep clean as they have a straight, circular, smooth, steel flue which drafts incredibly well. Unfortunately there are a few areas which we continually find giving our customers problems. Thankfully there are repair options available for all of these issues and some can be avoided completely with proper burning practices. The first issue is in the firebox with very delicate fire-proof composite panels. These panels are rather thin and if logs are tossed into the fire or forcibly placed on the grate the back panel can start to crack and fall apart over time. Because these panels are rather expensive to repair, we always recommend gently setting the logs down on the grate to avoid damage. The next issue is the grate itself. Pre-fab fireplaces require what we call a T18 cast iron grate. 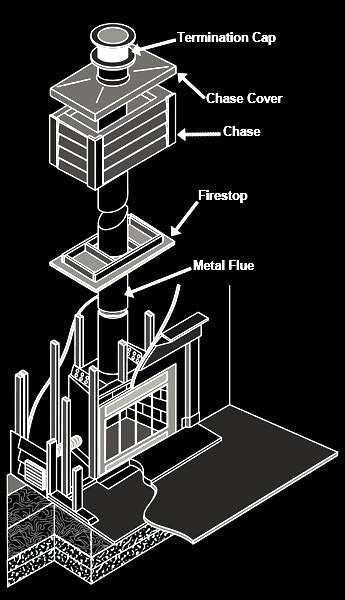 It is small enough to fit in a pre-fab fireplace yet it is far more robust than what comes with the system. Rather than three little bars our grates offer a heavy duty construction which will reduce smoldering while maximizing efficiency and safety. The last common issue we encounter is on the chimney exterior right at the top. The flat rectangular galvanized panel which acts as a lid to the top of the chimney often rusts out. We call this the chase cover and the fix is removing all the rusted components including the chase cover, caps, and storm collars and replacing all the components with stainless steel variants with a better design. If you think your system needs repair we recommend starting with a Level 1 Inspection to determine your system is safe or not. If something is visibly broken, the chase cover for example, we can certainly give you a free estimate as well. Head over to the contact page to get in touch with us.